BASIC PROMOTION) REVIEW/INTERVIEW: send us one or more ORIGINAL copies of the CD, DVD, vinyl or tape (NO CDR's NOR PROMO-CD'S, AND NO DIGITAL FILES!!!) you want to be reviewed; also previous records are welcome to be reviewed. DON'T FORGET TO SEND THE WHOLE PACKAGE including FULL ARTWORK, LYRICS AND A BIOGRAPHY, to enable us to make complete and detailed reviews and interviews, and guarantee you a better promotion. The cost is 25 euros or US dollars for the review, 25 for the interview, 45 for both of them. If you wish you can additionally send us 1 T-shirt/longsleeve shirt/baseball hat/bermuda trousers with the logo of your band/label's new album or tour. I will wear them during my website promotion clinics. This option is suitable for bands who already invested in the past for their promotion and nowadays can count on several fans. No form needed. Payment by cheque, hidden cash or bank transfer. Step #1) Ask us (Marco) for an offer to learn how much the medium customized promotion is going to cost. -An in-depth honest professional EXTENSIVE review with a precise unbiassed mark. -A phone or e-mail interview with us and the possibility of booking one with other zines. -Colour cover on the review page. -Band's or label's updated and detailed URLs, contact, discography, info and banner. -A spot in our homepage, in the news section, on our Facebook and Twitter accounts, and also in our updated marketing newsletter about the brand-new review, interview, your news (new releases, re-issues, line-up changes, live dates, new promo or live videos & other possible events such as showcases). Step #3) Pay by Western Union, bank transfer or send us a paycheck made out to Marco Ganzerli (recommended) or hide the sum in a package at your risk. Due to the fees, we don't have Paypal at the moment. Step #4) Once we have received your material, your order and your money we will send you a signed confirmation receipt with the undertaking to meet our obligations on the same form you will have sent us. In a couple of weeks the review is going to appear, and soon after the targeted brilliant newsletter will be spread according to a list of people involved in your specific music genre selected from our huge world's contact database (fans, labels, distros, radios, festivals, (web)zines, and so on); just to make a plain example, we WILL never send an extreme label or webzine a promotional e-mail concerning a gothic metal band! This is the most common promotion for unsigned bands of recent (re-)creation with a shameful budget. Ask us (Marco) for an offer to learn how much the maximum customized promotion is going to cost. If you accept, place your order by following the same steps shown above about the common medium promotion, with the exception of placing an 'X' on the maximum promotion option (see form above). -More interviews will be arranged with other magazines. -Half of your CD will be downloadable from our website at the links provided by our intense and capillary marketing newsletter to increase the buying incentive. -Two of your tracks will be used on a compilation CD to be sent to relevant magazines, webzines, radios and other media after receiving written permission from you or your label. -A key marketing service will supply international and national rock, metal and alternative press with copies of your CDs. -Optionally, we can also shoot a video for you with an excellent price/quality ratio. This is the most effective way for bands with a serious budget yet currently without a deal (no fear: our prices are way more reasonable than our competitors'). Such promotion requires a lot of time and experience, as complications and delays are always around the corner; unfortunately not many bands are able to do things properly and efficiently on their own for different reasons. Myspace, Youtube, etc. and the bands' websites are a good starting point but achieving the press, the hard radio stations and getting a review or a stream has become a more complex process today than years ago. Labels choose to sign bands they like and that they heard of and listened to somewhere, so you need to make an extra financial effort in this direction. NOTE: In any of the above-mentioned cases your band/label will take part of the list of promoted bands/labels/etc. for an undetermined period in our older promotion pages, so anybody will still have the possibility of visiting it whenever they want. List of bands and artists whose promotion we worked on: Astral Spirit (Russia), The Bloodshot Gamblers (USA), Carlos Lichman (Brazil), Emblema (Italy), Embryon (UK/France), The Finite Beings (USA), Tantal (Russia), Twilight Is Mine (Russia). You can send us 1 or more (old) copies of your mag or fanzine for an honest professional review. You can rent ad places at cheap fees in our website. Should you run a webzine, we can trade banners and links. PRICES differ from case to case: it depends on how long and what kind of promotion you need. I'll suggest you different options customized for your band's level and strategy and I'll find a cheap compromise for you. ADVICE: mark your envelopes containing CDs or other stuff directed to us with the words 'promo material - no value', in order to avoid custom troubles or bigger costs. Please note that I'll not give anyone your private data, and I'll make your transactions as safe as possible. I'm a buyer, too and I was ripped off in the past, so I know how it feels and now I know how to avoid traps. Google our site, contact our old customers and get information about my working, my strengths and the aspects I can improve. They are your colleagues, musicians like you in the music business. My data are exposed above because I have nothing to hide. 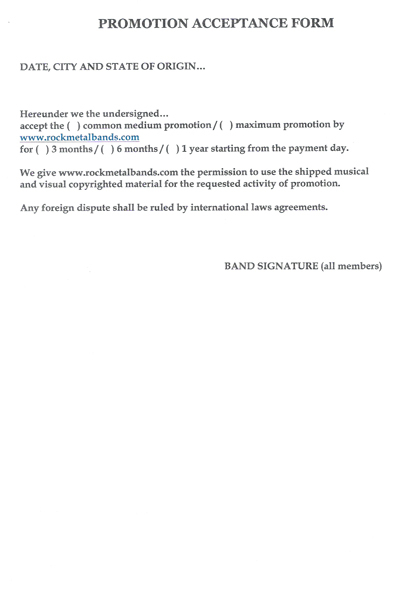 If you accept my conditions, you won't have any legal claims to me Marco Ganzerli or my site rockmetalbands.com at all. Moreover, you have noticed that I not only offer lots of free material but I also give you the opportunity of signing a short-term deal, and keep in touch by primary e-mail address, Facebook, Myspace or ICQ. All back-end support requests of any sort will be replied as soon as possible. With Skype you can even fix an appointment to see and talk to me directly. What more could be a sign of good will and professionalism?